Featuring Sta-Rite's modular media technology, these cartridge filter systems handle up to 15 times more dirt and debris than similarly sized sand filters. Available with 1 HP or 1.5 HP large-capacity OptiFlo® Series pump. FREE SHIPPING! Posi-Lok™ locking ring keeps curious hands safe. Split-tank design allows easy cleaning: rinse-in-place with a garden hose and you're done. Flow-balanced tank hydraulics direct water through each side of filter module for superior dirt-loading and to eliminate clogging. Easy to read information panels and top-mounted pressure gauge. 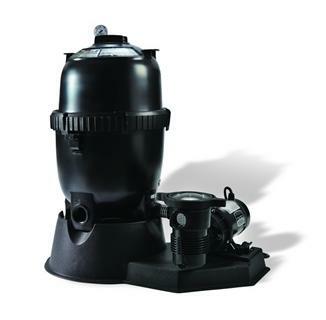 Includes 1 HP or 1.5 HP large-capacity OptiFlo® Series pump. A compact, small diameter footprint design so it fits in tight spaces. This system is so efficient that your pool may go an entire season before you need to clean your PLM above ground filter. 100 sq. ft. filter cleans up to 48,000 gallons. 150 sq. ft. filter cleans pools with up to 72,000 gallons. The System:2 Mod Media™ above ground system from Sta-Rite® combines the filtering capabilities of a cartridge filter with the low maintenance needs of a sand filter. Specially designed Mod Media™ cartridges--with 100 or 150 sq. ft. of filtration surface area--filter particles as small as 20 microns. An average grain of sand is 100 to 2000 microns in diamater! Plus, the Mod Media™’s filter is specially designed to handle 15 times more dirt than an equivalent sand or cartridge filter. 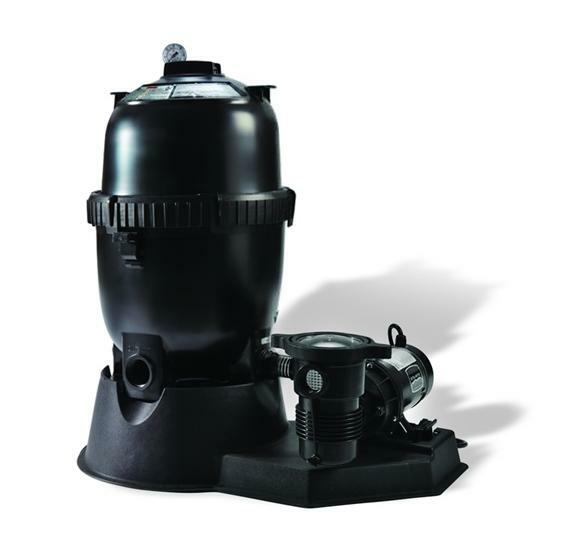 This system comes with a compact, high-tech tank that is built from Dura-Glas® composite. The tank, with its sleek matte black finish, is built to withstand weather and corrosion. The tank is also designed for easy access and "spray-and-go simplicity". Although you likely won't need to clean your filter more than once or twice per season, an easy-open "posi" ring closure allows you to rinse the Mod Media™ cartridges without removing them. Spray it down thoroughly with a garden hose and and the system is ready to get back into service. Driven by our powerful and efficient Sta-Rite® Opti-Flo pumps, the system produces optimal turnover rates. In fact, the system is so efficient you can run it less, saving you money on energy costs. The system comes complete with pump, filter, base, and hose connections. Invest in the premium Mod Media™ system this season for unsurpassed water quality and low, low maintenance. Click here to view the Mod Media System Manual & Warranty. Click here to view the Install Manual For the Mounting Base System.